Dallas was the perfect stage for LBJ to control the scene of the crime of the century. Johnson owned a media empire inside Texas. He won elections by hook and by crooked attorneys. His nickname “Landslide Johnson,” was sarcastic because he always won elections by late vote counts in Democrat precincts. Jack Ruby was connected to the Chicago mob and had a well-cultivated relationship with the Dallas Police Department. Ruby was the ideal man to shut up Lee Harvey Oswald and shut down the link to the assassination team. Ruby asked to be moved from Dallas where he feared for his life if he brought up the network he worked for. His request was not granted and he died in the Dallas jail. Mr. Ruby had a jailhouse interview with Dorothy Kilgallen, a nationally known journalist. She reported that the interview would blow the case wide open. She gave the notes of her meeting to her friend Margaret Smith for safekeeping. Ms. Kilgallen was found dead of a drug overdose on Nov. 8, 1965. Ms. Smith died two days later. The cause of death was not known. Carlos Marcello Mafia head with business in Chicago, Dallas and New Orleans was the financier of the assassination. Marcello’s casinos shut down by Castro in Havana cost the boss many millions. Then, Bobby Kennedy started going after the mobs in Las Vegas and Reno, where the mob shifted its casino operations from Havana. Jack Ruby had worked for the mafia for years and was their pay-off man for control of the Dallas police. Karyn, the beautiful daughter of Chicago journalist Irv Kupcinet, was found strangled to death in Los Angeles. The LA Times reported a telephone operator heard Karyn scream “They are going to Kill Kennedy” a few days before the assassination. She was strangled to death on November 26 or 27 and not discovered until Nov. 30. Investigators speculated it was a message to her father to stay silent on what he knew about Jack Ruby. Roger Craig was a Dallas policeman on the scene the day of the assignation. He found a 7.65 Mauser in the Book Depository. That was a fly in the ointment. The plant rifle was the Mannlicher-Carcano rifle tied to Oswald. The conflict of the other rifle showed at least two shooters. Officer Craig’s findings were ignored by the Warren Commission. In 1967 Craig was fired from the Dallas PD. Later that year, he was shot while walking to his car. The bullet grazed his head. In 1973, his car was forced off a mountain road and he was badly injured. He was shot again in 1974 and in 1975 was wounded when his car blew up. Later that year, he was found dead. Authorities called his death a suicide from self-inflicted gunshot wounds. Quite the survivor, not the profile of someone who commits suicide. Note gunshot woundS. Madeleine Brown, a longtime LBJ mistress, implicated her high-level lover and sugar daddy, implicating LBJ on taped statements before she died in 2002. What did she have to gain on her deathbed? Only the truth and peace with her maker. Johnson is the key to the Kennedy assassination. He benefitted the most. LBJ was a raw man. He was well-known for using the “N” word and lifted dogs up by their ears. Inside the Kennedy inner circle, talk of dumping LBJ from the ticket was passed talk and about to be a done deal. Good ol’ boy, Johnson ran the Dallas area police, FBI and regional CIA and Secret Service. What luck that Lee Harvey Oswald found a job in the Texas Book Depository two weeks before the president’s route. Who would know the president’s motorcade route but Johnson and his local Dallas Secret Service connections? Many experts believe that the shot that went through Kennedy’s neck came from the front of the limo, behind the vine covered picket fence on the grassy knoll, not the fifth floor of the Texas Book Depository to his back. Basic ballistics test also show the magic bullet that hit parts of the limo, Governor Connelly, and JFK deny science and evidence, the bullet was unscathed. The horrible explosion of the back of Kennedy’s head follows ballistics in that the backward blowout is much larger than the entry wound, again, from the front. “I am a patsy” are the only record of Lee Harvey Oswald’s side of the story. He was silenced by a 38 slug to the gut by mob errand boy, Ruby. After a night of questioning in the Dallas PD HQ, there are no notes or recordings. Why? Was it because Oswald described the network and that he was a CIA mole planted to watch the terrorist team do a dry run? Why was Oswald seen on the second floor drinking a Dr. Pepper 30 seconds before the shooting? Why didn’t Oswald have a real escape plan? Instead he took a public bus to South Dallas to the Texas Movie Theatre in Oak Lawn? Why did Oswald hide in a theatre if he were a radical freedom fighter? Why didn’t he try and fight to the finish? Why after all that would he say he is a patsy? Kennedy’s body was seized and flown back to Washington D.C. without the media scrutiny. There are reports of three wounds from the front. Triangulation ensured this was going to finish the job. Barr McClellan, author of Blood, Money & Power: How LBJ Killed JFK, accuses LBJ of being behind the JFK assassination. Implicates others of fore-knowledge of the plot, including Texas oilmen Clint Murchison, Sr. and H.L. Hunt, and FBI Director J. Edgar Hoover. Mystery fingerprint found on sixth floor of the Texas School Book Depository matches prints of Johnson aide taken in connection with a prior murder conviction. 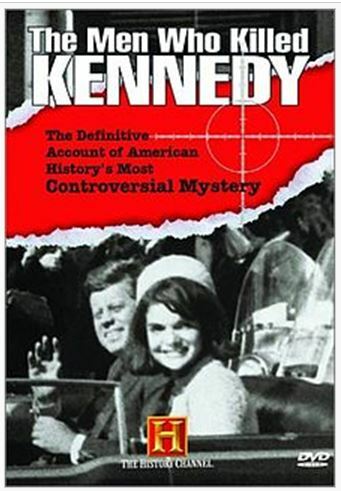 The Men Who Killed Kennedy began with two 50-minute segments originally aired on 25 October 1988 in the United Kingdom, entitled simply Part One and Part Two. The programmes were produced by Central Television for the ITV network and were immediately followed by a studio discussion on the issues titled The Story Continues, chaired by broadcaster Peter Sissons. The United States corporation, Arts & Entertainment Company, purchased the rights to the original two segments. In 1989, the series was nominated for a Flaherty Documentary Award. In 1991, the series was re-edited with additional material and divided into three 50-minute programmes, which were also shown by ITV. A sixth episode appeared in 1995. The series typically aired in November every year and from time to time during the year. In November 2003, three additional segments (“The Final Chapter”) were added by the History Channel, but the series is no longer aired. The ninth documentary in the series, entitled “The Guilty Men,” directly implicates former U. S. President Lyndon B. Johnson (LBJ) and created an outcry among Johnson’s surviving associates, including Johnson’s widow, Lady Bird Johnson, journalist Bill Moyers, ex-President Jimmy Carter, Jack Valenti (longtime president of the Motion Picture Association of America), and the last-living (at the time of the outcry) Warren Commissioncommissioner and ex-President Gerald R. Ford. These Johnson supporters lodged complaints of libel with the History Channel, and subsequently threatened legal action against Arts & Entertainment Company, owner of the History Channel. The History Channel responded by assembling a panel of three historians, Robert Dallek, Stanley Kutler, and Thomas Sugrue. On a program aired April 7, 2004, titles “The Guilty Man: A Historical Review,” the panel agreed that the documentary was not credible and should not have aired. The History Channel issued a statement saying, in part, “The History Channel recognizes that ‘The Guilty Men’ failed to offer viewers context and perspective, and fell short of the high standards that the network sets for itself. The History Channel apologizes to its viewers and to Mrs. Johnson and her family for airing the show.” Conspiracy author Barr McClellan, interviewed in the documentary, complained that although the historians examined the evidence, they did not interview him or Turner.